This Wadi Rum cocktail can be made in minutes and combines all the elements of a stiff drink sure to get you through the dark and cold days of winter. In the arid and wild terrain of the southern Jordanian desert is where you’ll find a protected land called Wadi Rum. Most people might know it as the setting of Lawrence of Arabia, the Oscar-winning 1962 film starring Peter O’Toole. In history, it’s where Colonel T.E. Lawrence led Arab forces north into Syria, eventually defeating the Ottomans and overtaking Damascus during World War I. But to Chris Hassaan Francke, owner of the Green Zone in Adams Morgan, Wadi Rum is more than just a movie set or historical landmark. It’s an experience that evokes a cocktail inspired by a camping trip he once took with his father. 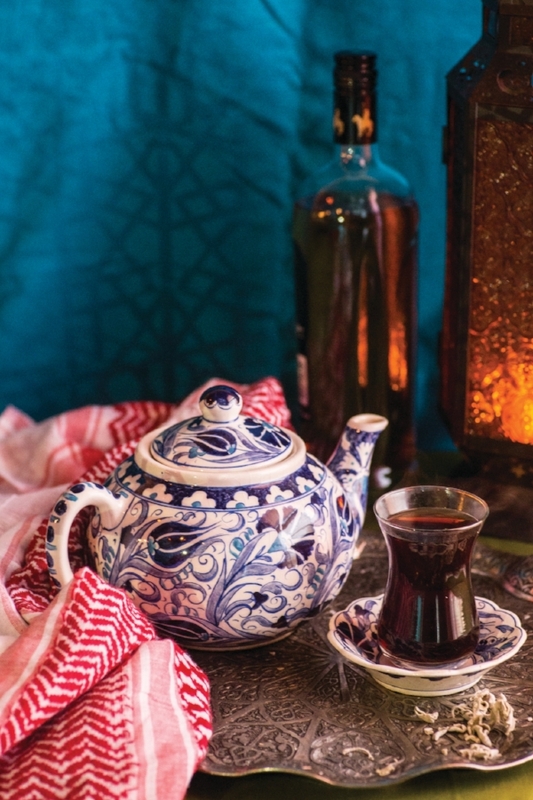 Drinking tea or coffee is how most Bedouin tribes welcome in their guests. They are nomadic people who serve hot beverages out of necessity—temperatures in Wadi Rum drop to near freezing most nights. The ritual of tea is something Francke says he’ll never forget. Closer to home this type of tea might be harder to find. Francke says you can buy sage tea at local Middle Eastern markets, like Mediterranean Bakery in Alexandria or Gourmet Basket in McLean. In Jordan, the tea is known as maramiyya and in Lebanon, it’s called qass’een. Or you can visit the Green Zone this winter, where sage tea is combined into a cocktail with smoky-sweet flavors conjuring up Francke’s Bedouin tent experience. Francke prefers a light-bodied rum, like Don Q Añejo or Mount Gay Eclipse, but if you want to substitute a local craft distillery, try Cotton & Reed’s dry-spiced rum. The drink can be made in minutes and combines all the elements of a stiff drink sure to get you through the dark and cold days of winter. Add 6 ounces of water to a saucepan and add the teas and sage. Bring to a boil and let simmer for 5 minutes. Or add the tea and sage to a teakettle and steep with boiling water for 5 minutes (the latter will produce a lighter tea). Rinse a heat-proof glass or mug with hot water. Then, add the syrup and rum—such as Don Q Añejo or Mount Gay Eclipse—and top off with hot tea, straining out the leaves. Stir briefly before serving. 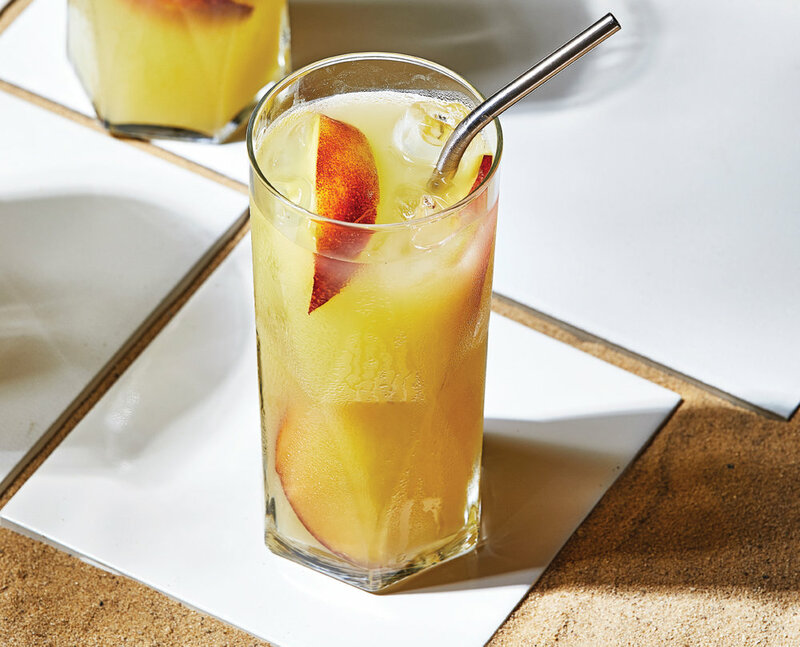 A Spanish punch, sangria, is a beautiful and most agreeable way to serve drinks meant for the warm nights of summer. Nothing says welcome to summer entertaining quite like a big chilled slightly sweaty pitcher of sangria served up full of fresh fruit of the season. Even better, it needs to be made ahead, to let the ingredients co-mingle and infuse. If you are serving 6-8, I would definitely suggest making a second batch. In my experience, no one can have just one glass. Add 1½ cups of the honeydew melon and ¼ cup of the white wine to your blender. Blend on high for 2 minutes. Transfer the purée to a large pitcher or Mason jar. Then stir in the remaining white wine, brandy and tequila. Add the kiwi slices, lime slices and remaining 1 cup of cubed honeydew melon. Cover and refrigerate at least 2 hours, up to overnight. Divide the sangria mixture evenly into serving glasses. Top each with soda water; stir in gently. Garnish with fresh mint sprigs and a lime wheel. *Make simple syrup: Take equal parts sugar and water and stir together in a small saucepan. Bring to a boil for 2 minutes, then let cool. Put extra syrup in a jar and keep chilled; it can be kept for a month. Place all ingredients in a pitcher and stir to mix. Refrigerate at least 8 hours or up to 48 hours. Serve over ice. Using a small, star-shaped cookie cutter, cut small stars out of pineapple or apple (pears work too) to get the “white” in the red, white and blue and for extra visual whimsy with this sangria version. Mix all ingredients together, except for the stars and sparkling wine, and let sit overnight or for 4 hours in the refrigerator. Stir in the fruit stars and sparkling wine just before serving. Place the blackberries, ⅓ cup sugar, ginger and mint leaves in a food processor (or blender) and pulse about 10 times or until the mixture is consistently chopped; it should look like a textured applesauce. Set aside. In a small pot, mix the ½ cup sugar with ½ cup water and simmer, stirring until the sugar is completely dissolved. Remove from heat and add the lemon juice. Chill the lemon syrup in the fridge for about an hour. Fill 4 glasses with ice. Put a heaping spoonful of the berry mixture in the bottom of the glass. Divide the lemon mixture evenly among the four glasses and give the drink a stir. Top each drink with a few ounces of the lemon-lime soda and garnish with a lemon slice. Serve immediately.